Enjoy this ski in ski out estate tucked away within the mountains, complete with a pond sitting in the backyard. Sleeps 14 people with beautiful 6 bedrooms and 6 bathrooms! 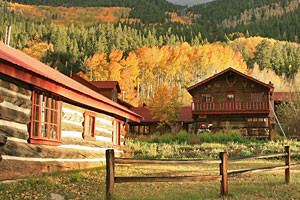 Relaxing, comfortable log cabin accommodations near Mount Elbert in Leadville, CO. One or two bedroom cabin available. Spacious lodge style condominiums for rent overlooking the Arkansas River Valley. Near five major ski areas. Close to Ski Cooper, Turquoise Lake, and historic Leadville.